There are days, I'll tell you, when juggling all the secrets of all the people who pass through my place can be wearying. After all, everyone who is anyone in Cabot Cove stops here for my famous blueberry pancakes, lobster rolls, and good old fashioned gossip. If it's not the mayor, Jim Shevlin, with some assistant or other, it's Evelyn Phillips, editor of the Gazette, sometimes with her photographer, sometimes without, or it's the sheriff, Mort Metzger, or Dr. Hazlitt, (Seth to his friends), and of course, my good friend, the mystery writer J.B. Fletcher (I call her Jessica). You may not believe this but when she's working on investigating a murder, which she often does, (even though the sheriff thinks he's the one who's responsible for solving all the cases in town), she counts on me for inside information. I tell her I'm a regular encyclopedia, telephone directory and news service rolled up into one. Small towns always have secrets, and Cabot Cove is no exception. It might be relationships you haven't expected or a history that doesn't fit with who the person is today (or who they want you to believe they are). Of course if someone else knows the truth, it's hard to keep that information from spreading. I've been around a long time, and I know the relationships and the histories. Jessica always says that even though she gets the news from the Gazette, between my luncheonette, the post office and Sassi's Bakery, she always learns something that wasn't in the paper. Sometimes it's just what she's looking for and sometimes it's something else altogether. Take her book, Close-Up on Murder, for example. I play an important role giving Jessica a lead she uses to follow up on one crime and prevent another. She learns a lot from me although she doesn't always give me credit. Worse still, when I pass along a juicy morsel I've overheard, she declines to reciprocate. I tell her, "Jessica, you have to give to get," but I can't convince her to tell me the latest rumor. She refuses to gossip. I could find it annoying, but I'm too fond of her to stay mad. Besides, my business is booming because Jessica always praises my pancakes in her books. 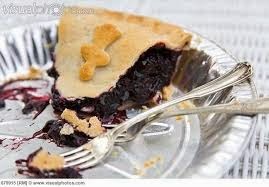 Now I know a lot of the people who write these blogs will tell you how to make their favorite dishes, but not me. After all, does Target tell Walmart? Does Cheesecake Factory share with Red Robin? My secret ingredient is what keeps my customers coming back. 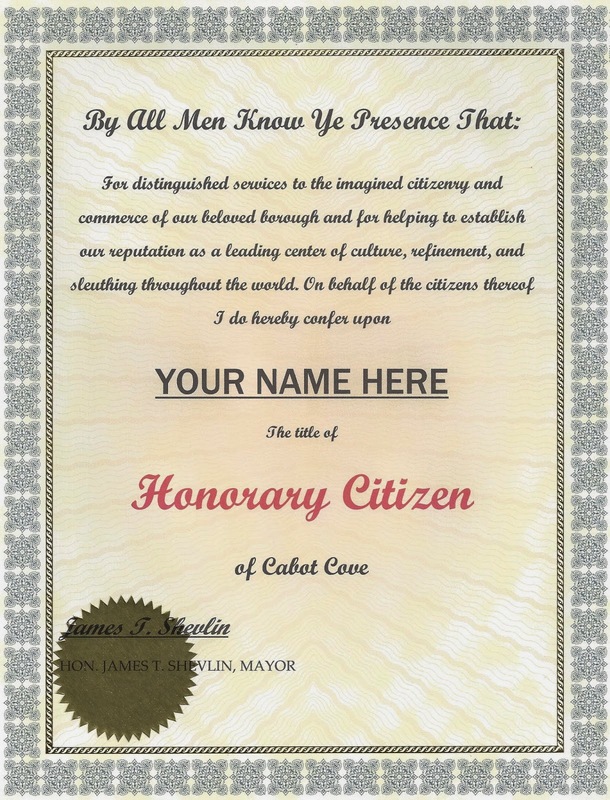 But even though I'm stingy with my recipes, our mayor is generous with his certificate of Honorary Cabot Cove Citizenship for one lucky person who leaves a comment below. So, tell me, not counting Jessica or me, of course, who's your favorite "Murder, She Wrote" character? You can be frank. Your secret's safe with me. I won't tell a soul. Summer is here! During June and July, Killer Characters is celebrating the Cozy Days of Summer by giving away a gift every day. Today, you can win a certificate naming you or someone you love an Honorary Citizen of Cabot Cove. Just leave a comment before midnight — with your email address so we can reach you — to be entered in today's drawing! Promise you won't tell? I have always been a fan of Seth. I am not sure but Seth is amazing. I have been watching the reruns on Netflix. It was one of my very favorite shows! I would have to say Sheriff Metzger would be one of my favorite characters. I have read and watched most of this series. I love it! I look forward to reading this one. My favorite character would have to be Seth, although I did like Amos. Definitely a toss up between Seth and Sheriff Metzger. It would be tough to choose, but I do think Seth had a very unique and warm chemistry with Jessica, so he'd probably end up the winner if it came to fisticuffs. Of course we love them all, too. Looks like Seth has the early lead. He always reminds us of the late Andy Rooney from "60 Minutes" a charming curmudgeon, grumpy with a heart of gold. I love Mort Metzger. Replacing a beloved Sheriff like Amos must have been a challenge, and I enjoy the good natured ribbing between Seth and Mort. I created Mara's character and luncheonette in Rum & Razors, fun character to write about. She was named after one of Donald Bain's grandson's little friends. Mara, in New York. As a former police officer, I'll have to say the sheriff, Mort Metzger is my favorite Cabot Cove dweller who is not Jessica Fletcher! 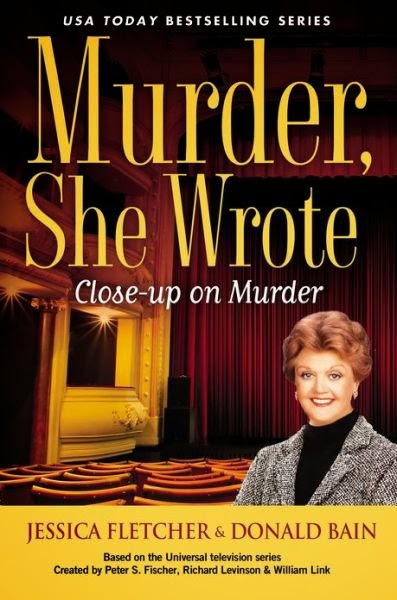 I used to watch Murder, She Wrote when I was younger and read almost all of the books!!! Love them!!! Though we don't hear from her too often, I really like Metzger's wife, Maureen. What I like about Cabot Cove is that small-town feel it has, where people are contented in the cosiness of their home, and feel a real sense of community. Maureen really embodies this for me, and I like thinking about what she's getting up to in the kitchen when Mort's at work. I admit Seth Hazlitt was my favorite. I always thought he and Jessica should have tied the knot before she went off to New York. He spent a lot of time in her kitchen! Just the romantic in me. Seth, of course! And then Amos. And Ethan - from way back at the beginning of the series. Seth...after Jessica...the characters are so good..
Well, Seth Hazlitt was your hands-down favorite character. Sheriff Mort Metzger was a respectable second place finisher. And even though she preferred Amos, Britt Nichol is the latest honorary citizen of Cabot Cove. Congratulations, Britt! love the msw show and books! no it would be fun!